Having joined the Board of Directors of Porsche Club GB in April 2014, Rob has been its national Chairman since April 2016. On Saturday 13th January, as part of the Club’s plans to improve stability and continuity for its staff, business partners, members and volunteers, Rob stepped down from his role early in order to let Board colleague Ian Yeoman take over the reins. This will allow Ian to be in role for 16 months. Rob was immediately appointed as the Club’s Legal Director, a role he will maintain until his term of office is completed later in the year. Rob’s time on the Board of Directors has seen Porsche Club GB grow from 12,000 to almost 20,000 members and this extraordinary growth has been managed by the Club’s full time team, headed up by Chris Seaward. Rob is particularly proud of the Club’s recent achievements with significant improvements to members’ experiences at national events such as the Silverstone Classic and the major expansion of the quality and extent of the Retail offerings from the Club with major new supply agreements in place with highly respected international companies such as Adidas Motorsport, Piloti shoes, Arai helmets and Lego to name but a few. Prudent business management generally has led to a very positive impact on the Club’s financial position. 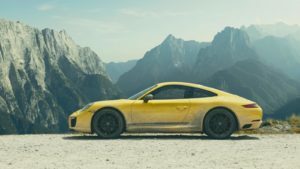 The Club’s magazine, Porsche Post is one of the best and highest circulation Porsche magazines in the world. Rob has assisted his Vice Chairman and Commercial Director Richard Watling in maintaining strong long term business partnerships for the Club with major organisations to include Porsche GB, Porsche AG, Pirelli, Lockton Insurance, Oracle Finance, Silverstone Auctions, Swissvax and Archant Dialogue. Having enjoyed making some fantastic friendships within a world far removed from his daily appearances in various Police Stations and Magistrates Courts, Rob intends to maintain strong links with the Club both nationally in a legal advisory and volunteer role and also locally once his term of office is complete. Any Porsche Club GB members who require specialist motoring law advice should contact Rob at his Preston office or through this site and he would be delighted to provide advice and representation either in person or with the firm’s Consultant Michael Leach who is a highly experienced specialist traffic Solicitor. For regulatory, business and general crime matters, senior solicitors Andrew Nottingham and partner Ivan Dickinson are also on hand alongside Lesley Nicholson and Beverley Hackett who run the Crown Court team. Lorraine Eccles and Trevor Rainford complete the team at Kellocks as specialist police station advisers.